Zimbabwean First Lady Grace Mugabe has returned home from South Africa after failing to turn herself in to police in Johannesburg to face accusations of assault, officials say. Police in South Africa had said they had expected her to present herself for questioning. A 20-year-old South African woman has accused Mrs Mugabe of hitting her over the head with an extension cord during a row at a hotel on Sunday evening. Mrs Mugabe has so far not commented. 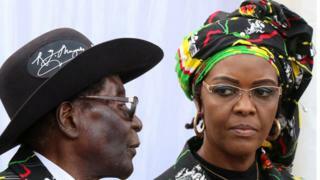 Zimbabwean government sources confirmed that Mrs Mugabe, wife of President Robert Mugabe, had returned home. "Yes, she is back in the country. We don't know where this issue of assault charges is coming from," said one senior official quoted by Reuters. Earlier, South African police said they had been negotiating with Mrs Mugabe's lawyers to get her to hand herself in. Zimbabwe's main opposition party, the Movement for Democratic Change (MDC), said Mrs Mugabe was a "total disgrace and a complete national embarrassment". "She has to be brought to order and indeed she has to appreciate that she is not a law unto herself," it added in a statement. Confusion surrounded the case with South Africa's Police Minister Fikile Mbalula saying at one point that Mrs Mugabe had handed herself over to police and would appear in court. She did not appear and police sources later said she had agreed to turn herself in but failed to do so. Gabriella Engels, a model, accused Mrs Mugabe, 52, of hitting her after finding her with the first lady's two sons, Robert and Chatunga, in a hotel room in Sandton, a wealthy suburb north of Johannesburg. Ms Engels released an image of a head injury online. "When Grace entered I had no idea who she was," she told South African broadcaster News24. "She walked in with an extension cord and just started beating me with it. She flipped and just kept beating me with the plug. Over and over. I had no idea what was going on. I was surprised. I needed to crawl out of the room before I could run away. "There was blood everywhere," she added. "Over my arms, in my hair, everywhere." She registered a "case of assault with intent to do grievous bodily harm", police said.